How to Activate/Deactivate the Google+ hangouts with Gmail Chat – will show you how to enable or disable the Google+ hangouts with the chat present in the left side of new Gmail. 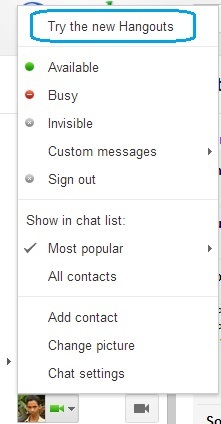 Google+ hangouts will replace the classic chat option on the Gmail as it has some more features than the old one. But at any time we can also activate the old chat. Before going throuth the article, First you need to enable the chat on Gmail (turn on) so that we will replace that with the Google+ hangouts. 1. Log in to Gmail with your Google Account ID and password. 3. 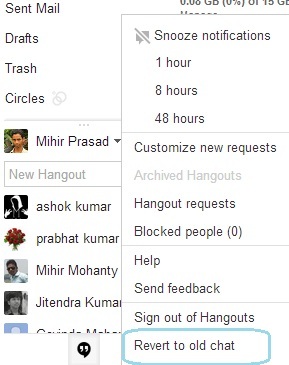 Now select “Try the new hangouts” on the open window. 4. It will refresh the active Gmail page on the browser and the new Google+ hangouts will be activate on the Gmail. 1. Login to Gmail with your Google Account ID and password. 3. Now select “Revert to old chat” on the open window. 4. Again it will ask for your confirmation regarding revert to old chat as a pop up message. 5. Click on “Revert to old chat“. 6. It will refresh the active Gmail page on the browser and the hangouts will be remove and the classic style chat will be activate on the Gmail. Is it possible to remove hangout from google? I’d like to know that too, cause mine keeps going to hangouts even though I reverted back. ugh..google destroys good things constantly making something that was once simple, impossible.